Thursday’s ride took me down the hill and around the Inner Harbor and up and over through Federal Hill for a day with A. and her sweet baby girl. The wind was light, which meant an almost balmy day, and it put me in such a good mood. I followed the newly-striped bike lane down Guilford down to South Street. It’s all scraggly, running right alongside parked cars, jogging right and left as it passes through one intersection after another. It’s striped all the way to the Inner harbor, big NO PARKING signs lining the street across Lombard. On this day, the bike lane was filled with limousines transferring rich people to the Renaissance hotel, and I was like, seriously? No parking, except, of course, for limousines? Cars do this all the time–just stopping for a second, no big deal, I’ll just be a minute as I double park here. Drivers just go around, I think because they’ve all been there before, too, needing to just take run in for a second. Drivers don’t honk and demand cars get off the road the way they do with bikes, who also, occasionally, require slowing or moving into another lane. And hence my demand that all people spend some time riding a bike in traffic so y’all just chill out a bit, but I’m holding onto my frustrated anger about the moving truck unloading in the Inner Harbor bike/ped path. Just a second, right? But on Thursday I was feeling chipper, and I stayed that way as I dodged pedestrians and cars and rode through piles of leaves. The ride home was even warmer, and I stopped to sit and watch people for awhile on Pratt Street. 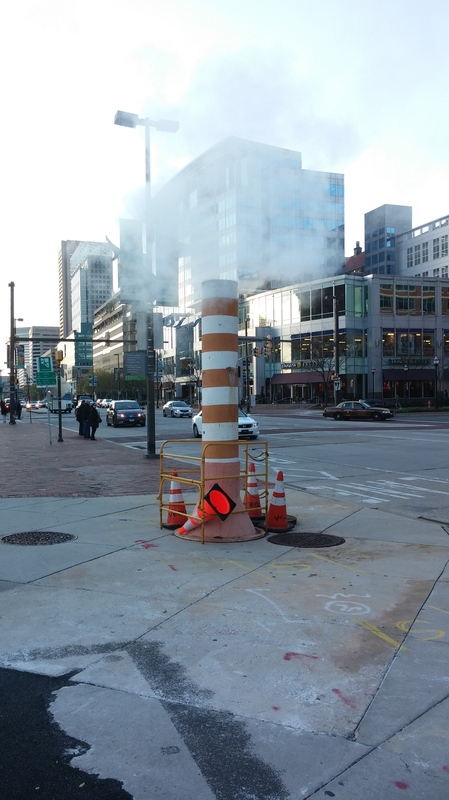 I snapped this picture of the steam column that will be right there for the next zillion months. It’s a reminder to me of how much is going on under the surface so that we never have to reckon with our trash or wastewater or the detritus of being “civilized.” I love those systems, but I wish they weren’t just magic to me. Time to book a trip to the Public Works Museum, methinks. Pedal, pedal, pedal, up the hill, finally a ride that didn’t end at the office in the books. This entry was posted in construction, infrastructure and tagged Baltimore, bike lanes, Federal Hill, infrastructure, Inner Harbor. Bookmark the permalink. Or, a trip to McCall and a in-depth discussion with the City Manager.